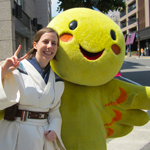 Rebel Legion :: View topic - Hoth Leia - Now approved! 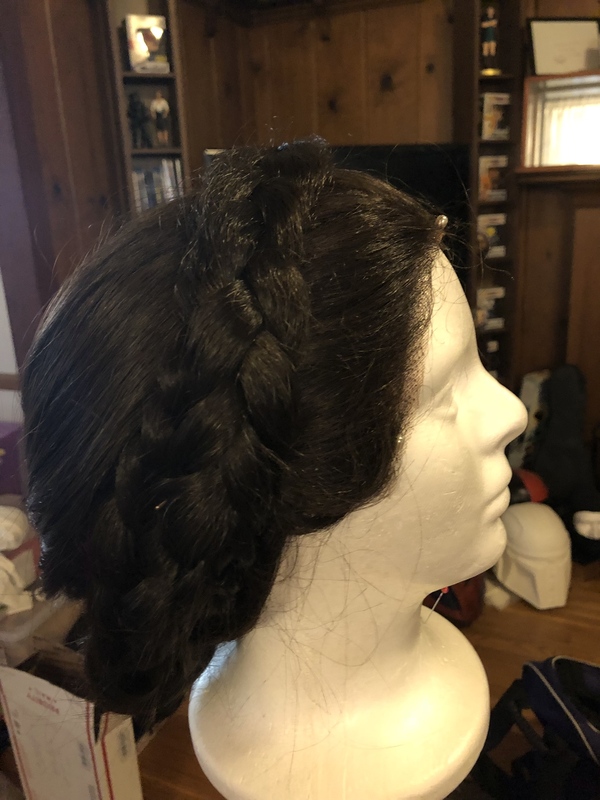 Posted: Wed May 02, 2018 7:49 pm Post subject: Hoth Leia - Now approved! So far I have my patterns and material for the vest and jumpsuit. I went with the Green Pepper patterns. 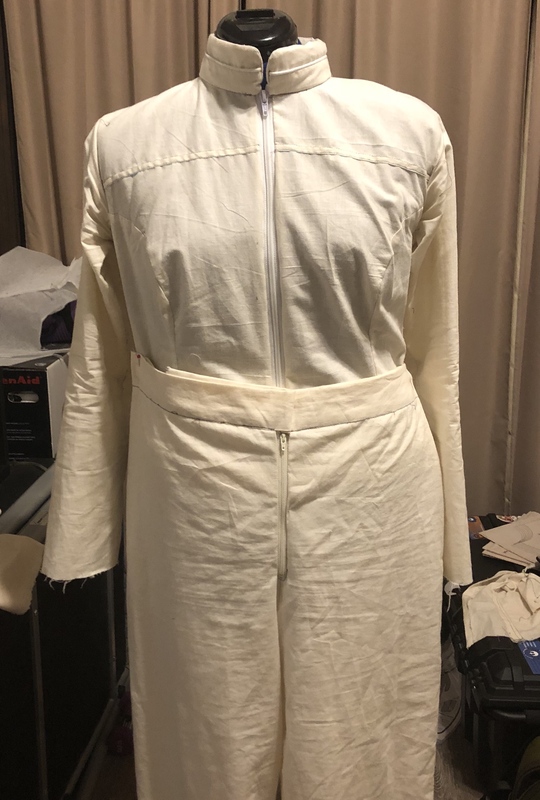 I know that others have said there is a ton of ease in the jumpsuit, but since I am bigger, I figure that it would be easier for me to make a smaller size to compensate for the ease. 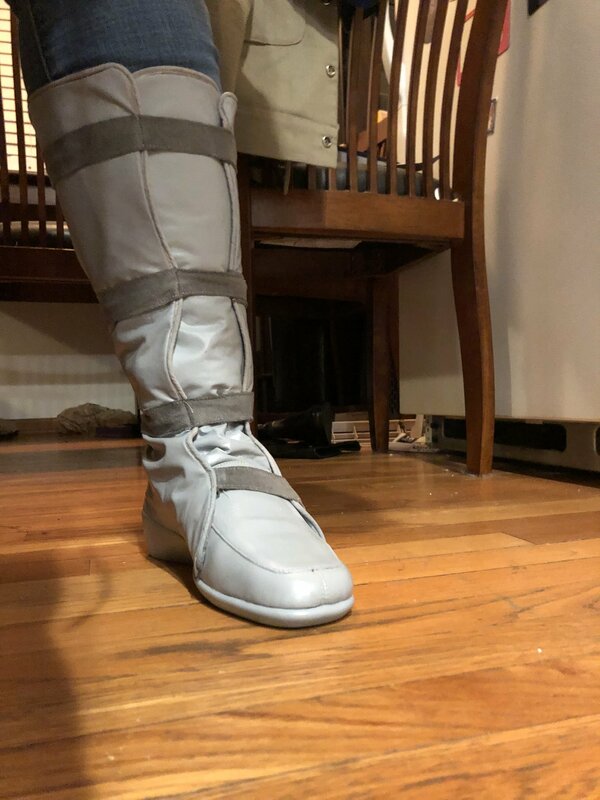 I have finished my boots! I wanted to wear them to Disneyland Star Wars night tomorrow, so I was motivated. This is the first time I have ever made footwear. 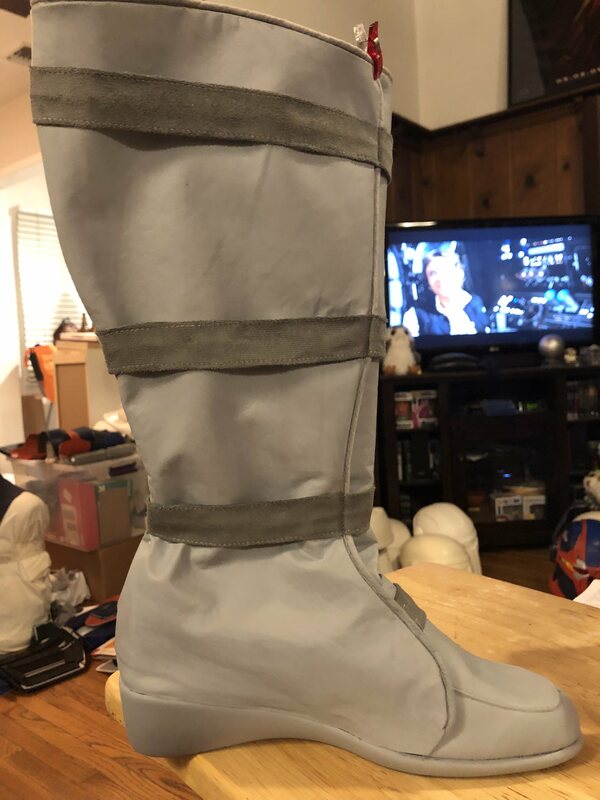 And picked up some grey vinyl and faux suede in the reminants bin at Joanns and got some grey piping. For now they are just painted with acrylic and a matte top coat. I will see how they hold up tomorrow night. Those look great! What kind of shoe did you use as a base? Nice work on the boots! Thanks! 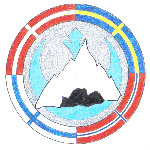 I included a link to the base shoe in the first post. After the test run, I discovered I need to figure out a different way to paint the soles. I think I will give them a light sanding and then use some spray primer before painting the acrylic. There are a few other little adjustments needed - shoring up some annoying gaps and stitching the tops to the base as an extra precaution. They held up nice and I was fine in them for the over 5 hours spent at Disneyland. 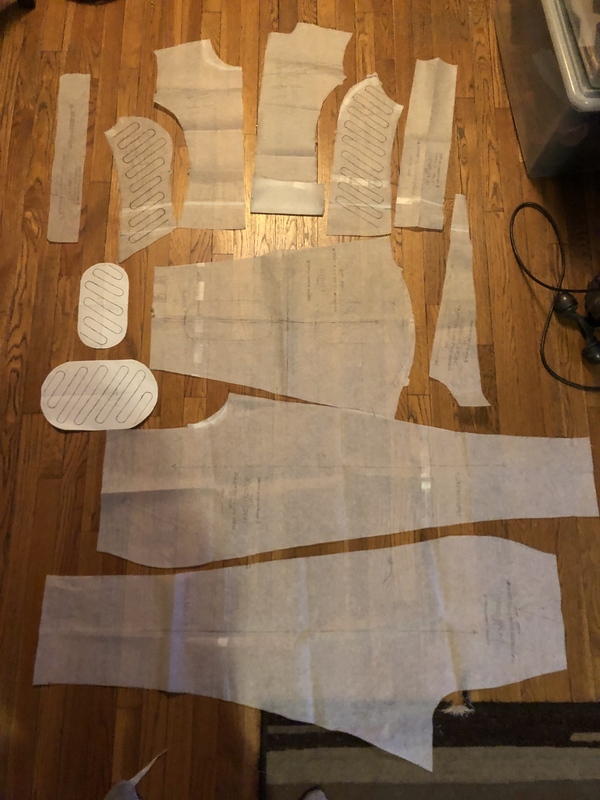 I also traced and cut out the base pattern for the jumpsuit. I need to figure out how to modify it - alter how the sleeves attach, add prices seams and a yoke in the back. 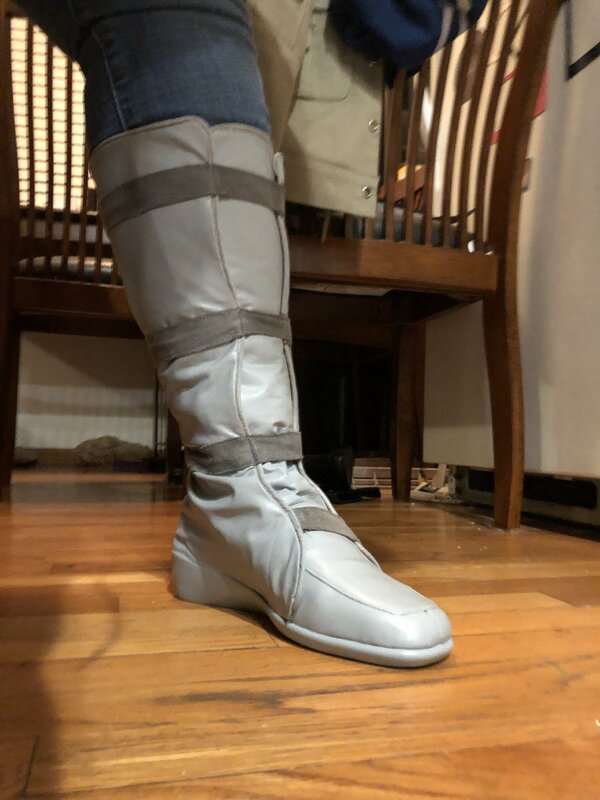 I lightened the straps on my boots so they are closer to the base color. 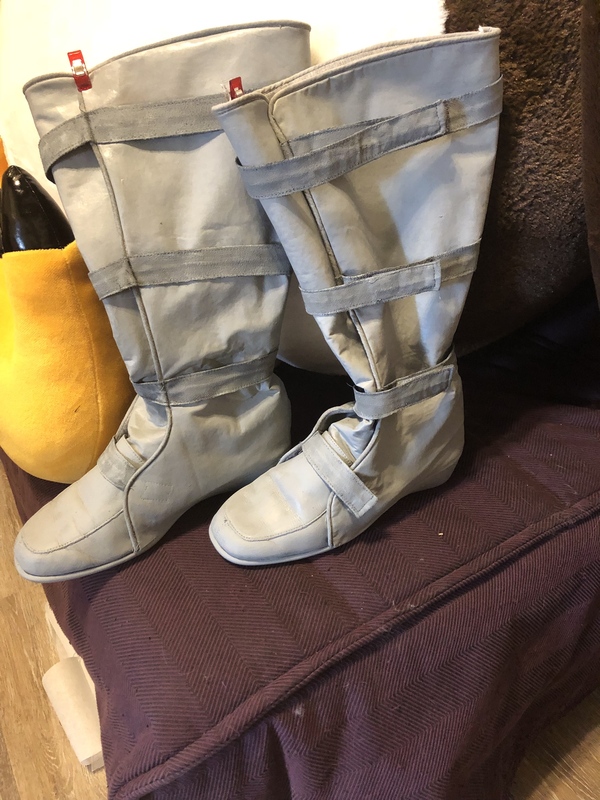 I hand sewed the spats down to the base shoes. I still want to sew the tongue to the spats to prevent gaping. 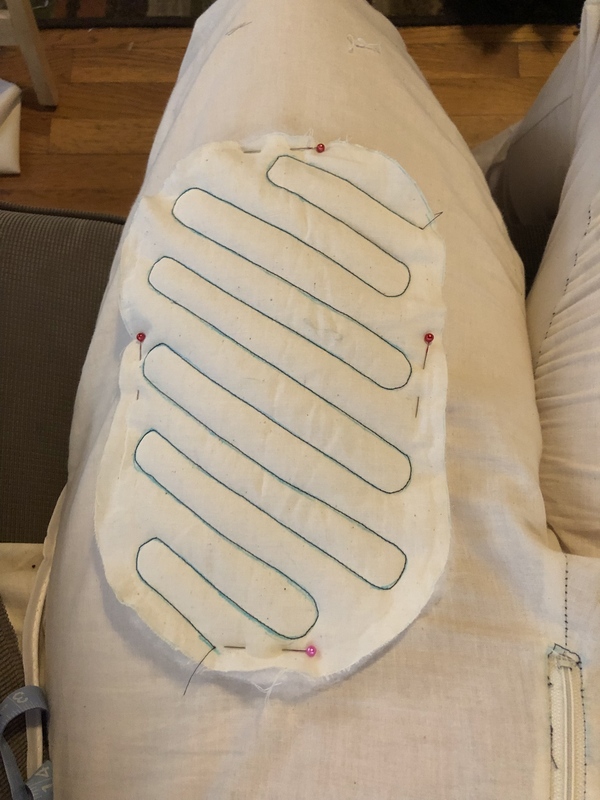 I also have a base pattern for my jumpsuit. 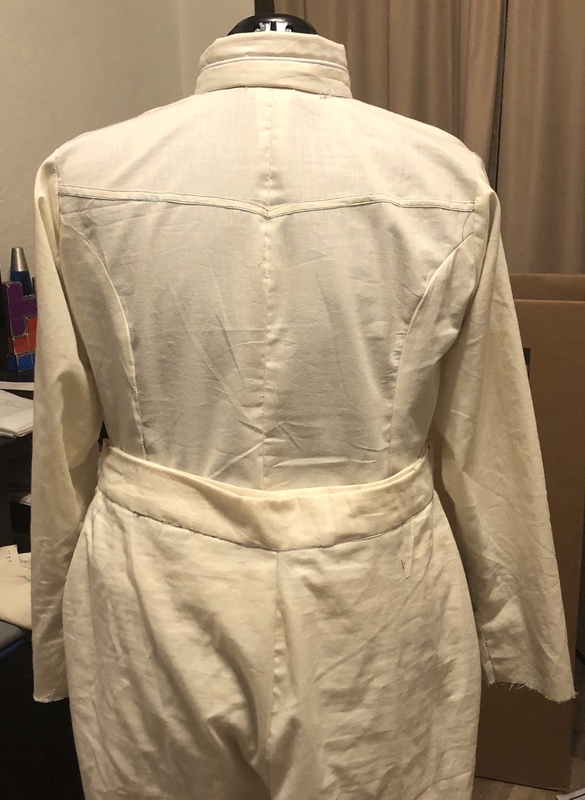 I didn’t put the piping in the top of the collar or the princess seams. 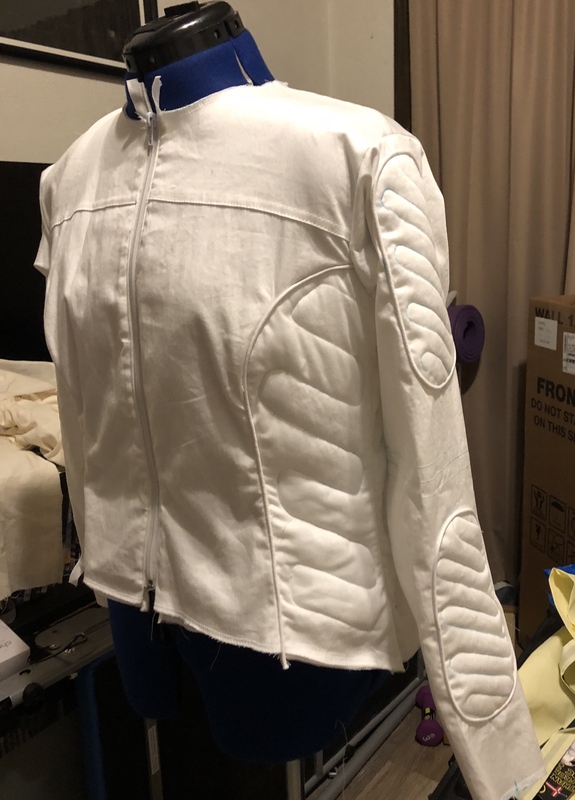 And I didn’t do the flap to cover the zipper in this mock up. Now I need to size the arm and thigh pads. 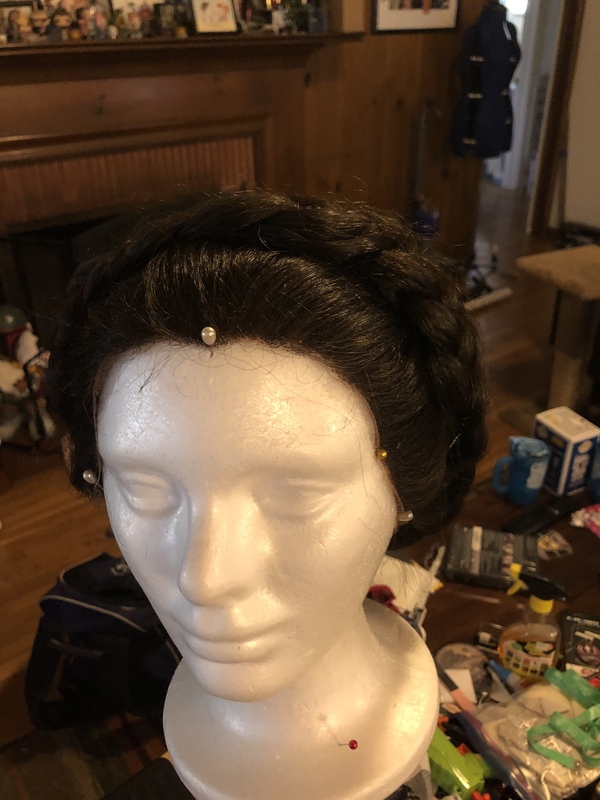 This is coming along BEAUTIFULLY, Amanda! Can't wait to see the finished product! Awkward photos because my husband is out of town, so I had to manage by myself. I am keeping the zig zag lines with the same spacing for the pads as well as the quilting on the side of the bodice. I am also making it 2 pieces with the belt covering the waist. 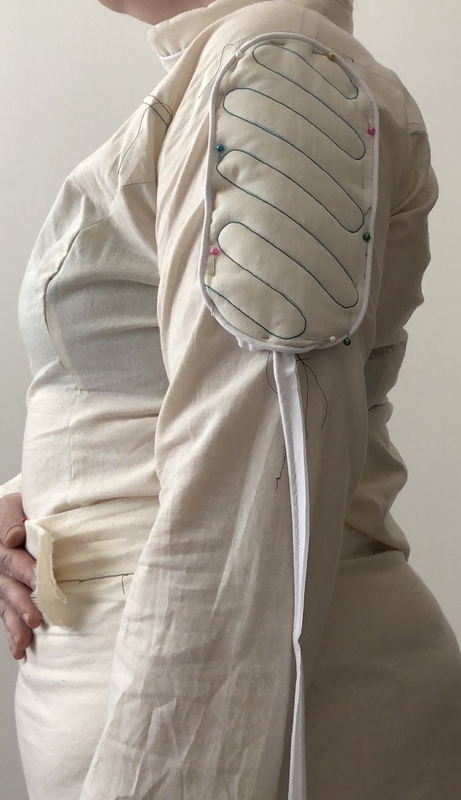 I extended the bodice down (even further in the back) so it will tuck into the pants and not slip out. I will probably also use a bit of Velcro. 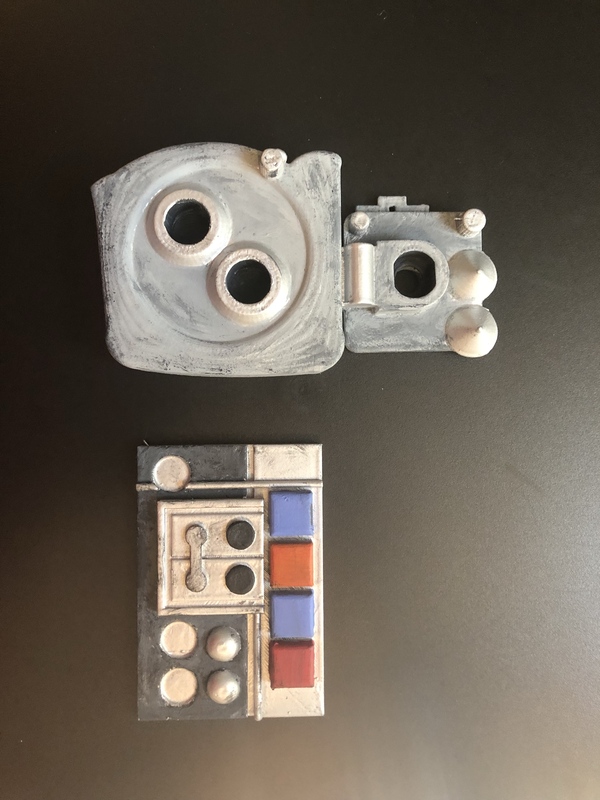 Here are all my pattern pieces. 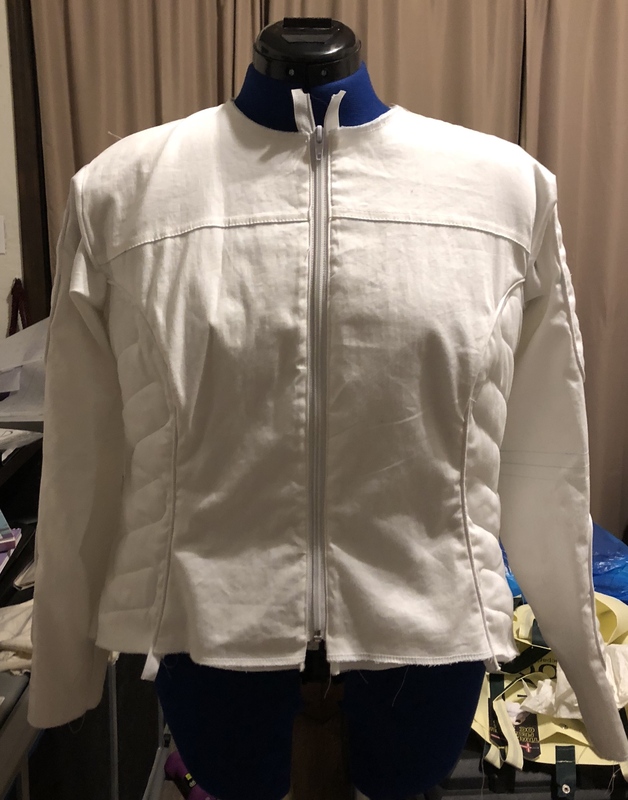 I have washed my fabric (a white cotton sateen with 3% spandex) and as soon as it is dry, I am ready to cut into it! 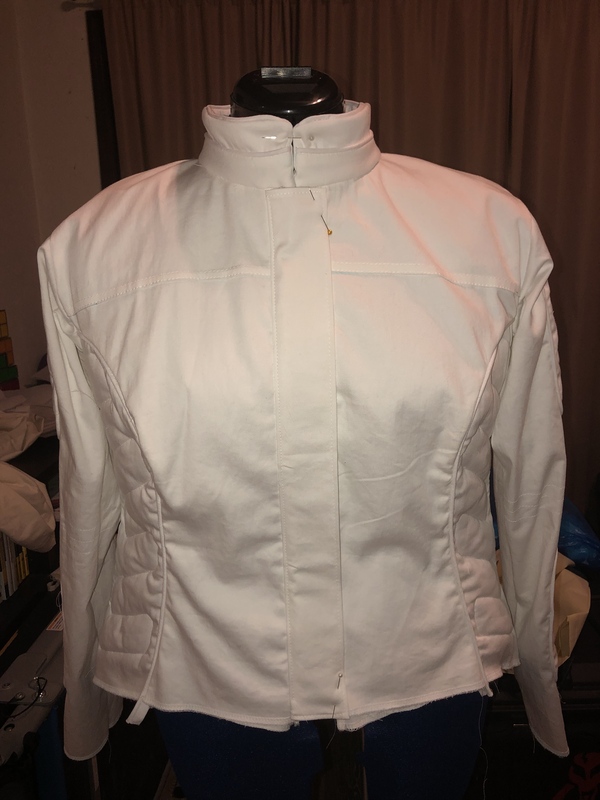 I only have the collar and the front zipper placket left for the top of the jumpsuit. FYI, the material I am using is a Cotten sateen that I got at Joann’s. I am done(ish) and will take submission photos this week. I forgot to do the hooks at my collar in this picture. They are there. And I plan on fixing the gap in my boot at the ankle. That is not a seam in the back of the vest, just a fold that I need to steam out. Also you can probably still see some blue fabric marker. I also had some pictures with just the jumpsuit, but damn is it unflattering. 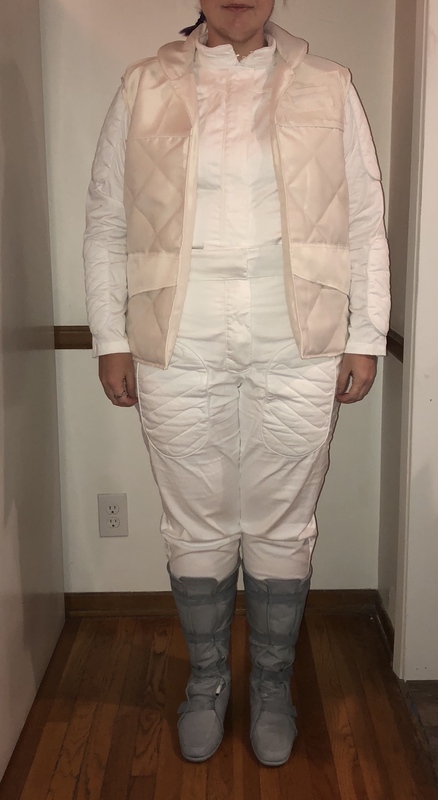 I do have the boots for Bespin escape (I am just missing the hair), but I don’t know if I am going to submit it. Looking great! You make such fast progress. I agree with sewing the tongue and sides of the spats together. Mine are always slipping apart when I wear them. FYI, I have been officially approved with this costume! 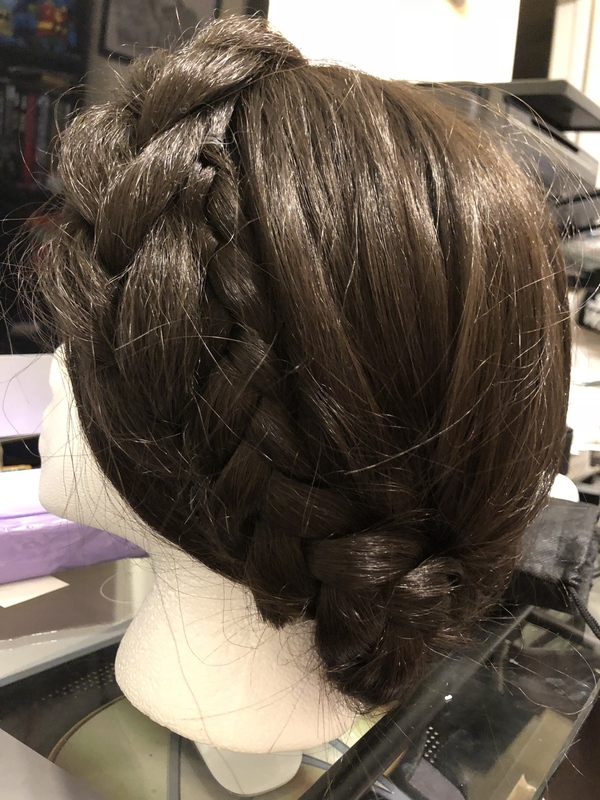 There were no changes needed for the costume at all as submitted, but I did have to restyle my wig. 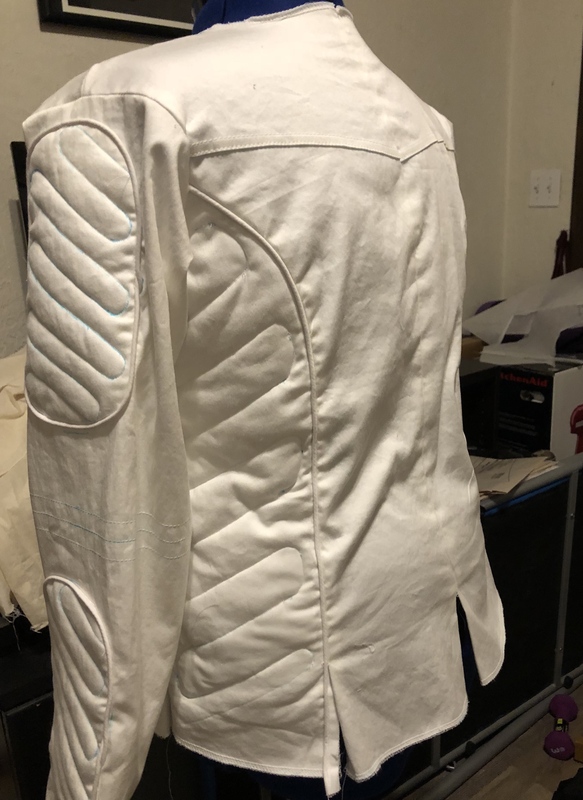 I don’t think I mentioned the fabric that I used for the vest. It was a satin twill in the color eggnog that I got from Joann’s. I used the wrong side since the right side was a bit too shiny. 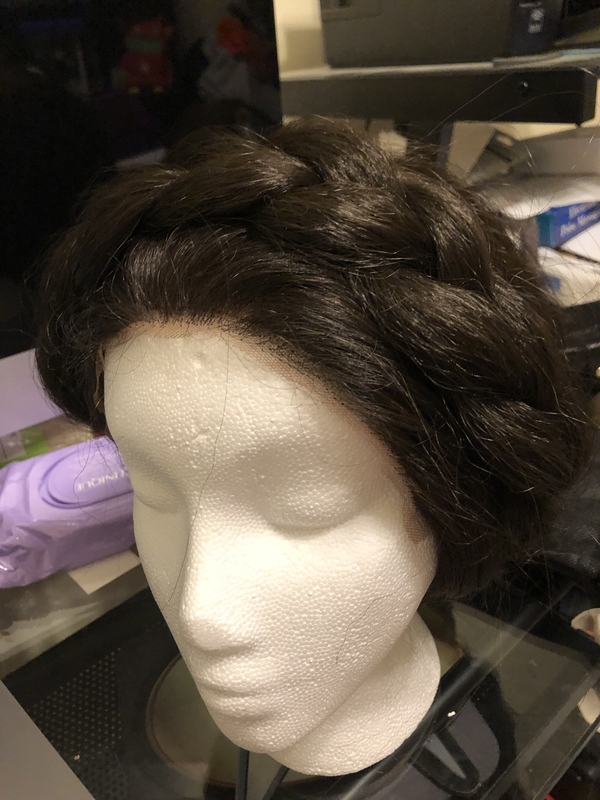 Here are pictures of my restyled wig. What an awesome thread! 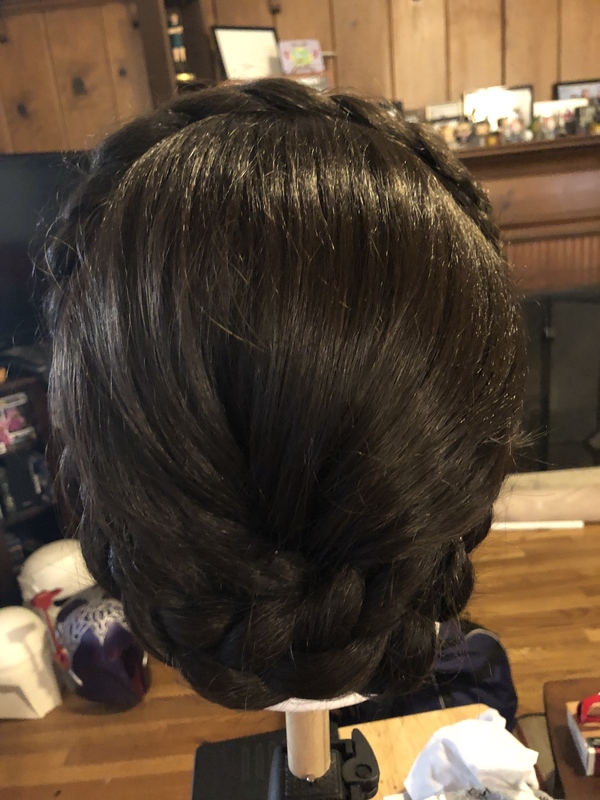 Thank you so much for sharing your work!